The history of nineteenth century art is the story of a struggle against schemata in the arts. The only remedy for the artist who wanted to avoid formal formulas, the rules of how to paint and sculpt, was a careful study of nature. Nature was seen as a source of objective truth. For the Realist artists, science and history became the models for a new mode of action. It was assumed that history was a “science” based upon careful and impartial observation of the facts and evidence, and that science was a procedure that rejected metaphysics and belief systems and relied upon empirical evidence. The Realist artists followed unconventional and non-academic methodology, based upon empiricism, unsupported by traditional artistic techniques. Therefore, “realism” in the nineteenth century can be defined as the necessity to render only what could be seen, eliminating content that could not be witnessed, whether the past or fantasy. Although the Realist artist could or should respond only to the contemporary, an entirely new world of content opened up, suddenly as the ordinary and the everyday became accepted subject matter among the “advanced” or avant-garde artists. Realism stood for a rejection of all that was false in art, from imaginary content to time worn conventions of pictorial illusionism. Truth became equated with authenticity and sincerity, the prime motivations of the Realist artist who rejected the poncif of training and learned technique. For centuries painting had been based upon a number of conventions or schema or art devices, developed by artists over time, which stood for reality and operated like signs. These signifiers could be read by the spectator, reinforcing the fact that art was a language with its own grammar and syntax and its own complex vocabulary. Perspective was invented in the Renaissance, provided, through the use of orthogonals converging at a vanishing point, an illusion of space, a space ample enough to contain volumetric figures and objects. Chiaroscuro gave them three dimensional objects the illusion of volume on a two dimensional plant, similar to the appearance of sculpture, especially that of bas relief sculpture, through a system of lights and darks. The gradation of tone creates the illusion of a form that is advancing and receding. Chiaroscuro not only provides the means of volumetric illusion for not only single objects but also for the composition as a whole. Important areas are highlighted and as the composition moves inward from dark edges to a light filled center, focusing the viewer’s attention on the subject. This hierarchy of elements in the composition is further reinforced by the use of aerial perspective in which the outlines of objects far away are blurred, compared to those close at hand which have sharp outlines and contours. This play between blurred and sharp contours also works within the composition as a whole, regardless of distance, to focus the viewer’s attention on important details and parts. Thus the viewer is directed through use of conventions of artistic devices in the reading of the painting from less important to more important hierarchy of detail and parts, adding up to a unified whole of chiaroscuro, lights and darks, within a structured composition composed according to the rules of perspective. The vocabulary of art includes, in addition, a series of gestures, poses, and postures called by avant-garde artists “rhetorical,” which stood for feelings and emotions and actions and could be decoded by the audience. The entire system of conventional painterly devices and signs was challenged by the so-called “advanced” artists in the nineteenth century, struggling to replace what can be called an academic or conventional realism, which depended upon schemata. The Realist artists sought a fresh look at nature and the world around them. This swerve on the part of artists, looking away from the classicism that had ruled since the Renaissance–hundreds of years–was most acute in England and France, nations which had strong art Academies. 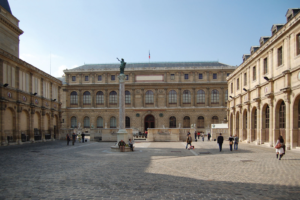 The French Academy in Paris and the Royal Academy in London were strong presences not only in educating artists but also in setting the rules for how art should be made, what content was desirable, and, perhaps most important, was outlawed or disregarded or candidates for rejection. Although other European nations had academies, patterned after these early prototypes, their establishments were not as venerable and their art worlds were not as seminal as Paris in setting trends and styles. That said, the art academies of Berlin and Vienna were as rigid as the French and the Royal Academies, and, although the rebellion in those nations came decades later than that in London and Paris, the revolt against the establishment also came to the nations to the east of France. However, by the time the east European artists rose up against their artistic oppressors, the day of Realism had come and gone. Therefore the discussion of Realism as a movement that was anti-academic should be confined to the two principle battlefields, Paris and London, where the classically inclined academies faced the unrefined ordinaries of the everyday. Like Classicism, Realism was international in scope and diverse in genres. There were realist novels and realist paintings that emerged from Russia–Tolstoy’s War and Peace–to England–George Eliot’s Mill on the Floss–and points in between. Realism as a literary and visual arts movement was paralleled by a rise in positivist philosophy, a philosophy based upon or inspired by the scientific method. As discussed in previous posts, positivism, whether that of Jeremy Bentham in England or Auguste Comte in France, emerged at the same time as Realism in the arts. Reflecting what seems to have been a wide cultural shift, whether in literature of philosophy or the visual arts, Realism was empirical, meaning based strictly upon what was seen, felt, smelled, heard–available to the senses of the viewer. The artist needed to be objective, like a scientist, disinterested and distanced from the topic of examination. Realism emerged just before and during vast political changes in Europe, changes inspired by the failure to fulfill the promises of the French Revolution of liberty, fraternity, and equality. Removing monarchs did not necessarily result in liberty, much less equality, and the nineteenth century proved to be a disappointing shift in political power from one group, the aristocracy, to another, the bourgeoisie. 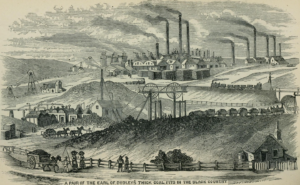 Either way, the lower classes were shut out and shunted to a harsh future in factories where they were exploited in the name of a new and unsetting Industrial Revolution. This new economy was very disruptive, unending ways of life that had existed for centuries. As landed wealth became less important and as business and industry began to dominate in the economy, the political weight shifted from the rural areas to the urban areas which were rapidly expanding. It is customary to think of French art when discussing art within these parameters of social and political change, but the economic model of the industrial revolution was set by the British. What made the French situation unique was the slow manner in which the nation developed industrially–compared to England–and the extent to which the provinces of France remained untouched by the new economy. France had one modern city and that was Paris. Not as large as London, but trendsetting in the artistic culture, Paris dominated in the creative arts and set the standards. In future posts the resulting contrast between England, where the Midlands became an industrial belt, and France, where the outlying regions remained in the eighteenth century untouched by progress and the impact upon art will be further developed. To traditionalists the Black Country is the area where the 30ft coal seam comes to the surface – so West Bromwich, Oldbury, Blackheath, Cradley Heath, Old Hill, Bilston, Dudley, Tipton, Wednesfield and parts of Halesowen, Wednesbury and Walsall..he region was described as ‘Black by day and red by night’ by Elihu Burritt, the American Consul to Birmingham in 1862. Realists artists emerged out of and because of these huge social and political changes that were sweeping Europe, and the artists of the mid nineteenth century would be developed into two groups: those who conformed to the Academy and those who were beginning to respond to the new culture that was emerging. From the artists’ perspective, it was necessary to begin the process of developing new visual and literary languages to express and explain this new reality. However, the art audiences who came to the Salon exhibitions were behind the artists. They were trained to like and admire academic art. Academic art was entertaining and taught lessons to the public. Attending an exhibition was rather like going to school; one would be educated and conditioned to be a good citizen. One would learn what the state wanted the citizens to do and to be. The Realists did not follow these academic rules of content, which were based upon the belief that “art” had to transcend reality in order to speak of higher things. Realist artists contented themselves with observing the world around them and recorded their own time and place. The Realist artists startled audiences, not by a careful copying of nature, but by the choice of content. Often these artists selected the lower classes as their focus of attention, not as objects to be studied, but as content to be elevated above the status of “genre” or studies of everyday life. The notion that marginalized people and places were worthy of artistic attention convinced conservative art audiences that the Realists artists were not only discarding artistic conventions but that they were also deliberately provoking public disapproval by showing the public sights that were “ugly.” In discarding the traditional idea that only aspects of “beauty” was the province for artists, the Realist artist answered that the world was a given and that the role of the artist was to respond non-judgmentally without preconceived ideas. For the Realist artist, the world is a given and the sole aim of the artist is to describe this world. In attempting to see the world without the subjective or the personal or the emotional, the artists were acting like Positivist philosophers. Idealism was rejected and ugliness was accepted. 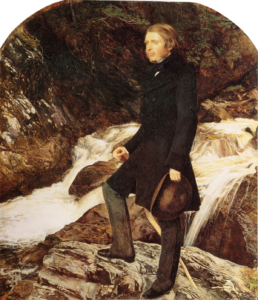 Like Courbet, Ruskin was a figure who espoused a form of “realism” but, as shall be seen, the “definition” of realism evolved over the decades from the 1840s to the 1880s. 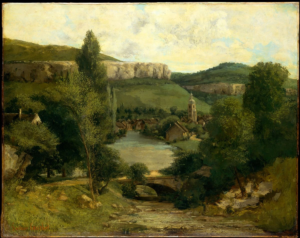 Ruskin still sought some form of beauty based upon the reality or the truth of nature; Courbet found realism outside of Paris, in the countryside where age old ways of life existed but adjusted to the coming of the next phase of Realism–modernité–an urban phenomenon.